More on Mohsen al Attar - Education is a "Political Intervention"
Mohsen al Attar is the first lecturer in Islamic Law at the University of Auckland. He specialises in Law and Development, Islamic Law, Globalisation, International Trade Law and Intellectual Property Law. Mohsen al Attar is also a self proclaimed Marxist who sees education as a politicisizing process. What some people might term "brainwashing". According to al Attar , education is a "political intervention", which has "revolutionary potential". Mohsen al Attar made these remarks in September 2009 at a public event in Auckland. The occasion was Emory Douglas and Mohsen al Attar: Education for Emancipation, a lecture/exhibition at the Gus Fisher Gallery, 74 Shortland Street. 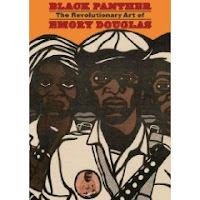 Exhibitor Emory Douglas was former Minister of Culture for the Marxist-Leninist/ Maoist leaning Black Panther Party in the USA. Emory's illustrations graced the Black Panther newspaper and countless posters for more than a decade. Emory Douglas discusses his exhibition and experiences in the Black Panther Party with Mohsen al Attar, Faculty of Law, who will address links between education, oppression, revolution and liberation. “Education is much more than the technical practice of learning but, in fact, a type of political intervention in which the student acquires greater understanding of the world they inhabit and the possibilities of transforming it via established and novel ways. Emory’s work has been inspirational to many including myself precisely because of the novelty of the images and the powerful message underpinning it. That's right Kiwi taxpayers. You are paying the salary of a man who believes that education is not just the "technical practice of learning" but is a "political intervention" with "revolutionary potential". All you have to do is look at the UK and Europe, it's a long, slow process with these people but I say 'Be afraid NZ, be very afraid' Like many, we left Britain to get away from the rampant growth of islam and now we see it growing here. I question this clowns credentials. Quote:"Mohsen al Attar is the first lecturer in Islamic Law at the University of Auckland. He specialises in Law and Development, Islamic Law, Globalisation, International Trade Law and Intellectual Property Law." In the US, an Intellectual Property lawyer (patents,trademarks,copyrights) must first achieve competence as a scientist or engineer to qualify for testing and licensing with the Patent/IP bar. None of Mohsen al Attar's credentials imply he is a biologist, chemist, mechanical or electrical engineer. Intellectual Property specialist? Prove it. Perhaps NZ would do well to re-examine Mohsen al Attar's credentials and re-evaluate his competence to 'teach' as well. That aside, I am not sure exactly how his views about education in anyway reflect a coming wave of islamic dominance in New Zealand? I personally would welcome a more critical approach to education that teaches people THINKING skills rather than absorption and regurgitation habits. Our society can only be robust if we have the courage to assess and reassess it. Perhaps what is being reflected is your own xenophobic fear straight back at you. I challenge you to do something more courageous than some poorly written blog. Why not email him and ask him why he is here? What he makes him an intellectual property specialist? Yes more than happy actually Trev. The black panthers made a proud contribution in the fight against racism. Mohsen is one of the most popular law lecturers at Auckland Uni. All the law students who have been taught by him tell me that he is an awesome teacher. I attended that lecture by Mohsen and Emory Douglas and the room was packed. I got there slightly late so missed out on a seat and had to join the crowd of people standing at the back. What does that prove Cameron? Hitler was popular, so was Maggie Thatcher for that matter? Popularity means nothing in this context. Lecturing in Islamic law--the next step is trying to get sharia law instituted. Get this Islamofascist out of NZ. Mohsen Al Attar is an outstanding law lecturer. Having done a paper with him myself I was satisfied that he taught Islamic Law with objectiveness and in a non-protruding manner (myself being an atheist). As amusing as it is to entertain the idea that Auckland University is on the verge of institutionalising sharia law, it is only necessary to meet Mohsen to qualm your fears. Trevor, I am glad that you posted your opinion here, because it shows the sort of tacit intolerant views of the old New Zealand that are present but not usually spoken of, such that my generation is working hard to eradicate. I am perplexed as to what rush of excitement would entice you to compare a well respected law lecturer to Hitler. Trevor, as a young New Zealander I challenge you to accept the new multi-cultural New Zealand, where we are able to learn from others no matter what their race, religion or political views. Welcome to the new New Zealand Trevor, the sooner you can learn to embrace diversity to sooner you will be able to correctly identify tax payers money well spent!